I find this to be a good puppy food, we gave it to our dog in his first year. He seemed to thrive on it. Our dog also liked to eat it! The only biscuits we use when we have pups. When they are young we soak it in boiling water so it’s soft for them, once they are older we give them unsoaked and the puppies love munching on the biscuits all day long. We have tried almost every brand of puppy dry food available, and this is the one Kitty goes back to every time! Very easy on her tummy, have not had any digestion problems at all. Well priced, and a bag lasts a fortnight with two meals a day. If there was another flavour to choose from, I would have gone 5 stars!! 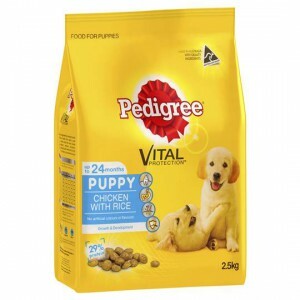 How would you rate Pedigree Puppy Food Chicken & Rice?